In SoCal, a dip in temps that moves us from “For real, there’s no A/C strong enough,” to “Ooh, this light cardigan is cozy!” can mean only one thing: fall. While our friends to the north and the east are entering the winter of their discontent, we’re enjoying the slight chill that comes from the ocean breeze after the sun goes down. But while our day-to-day situations stay more or less the same here, there’s one thing that should change when the calendar says Pumpkin Spice: your hair color. Here are the top three reasons why. 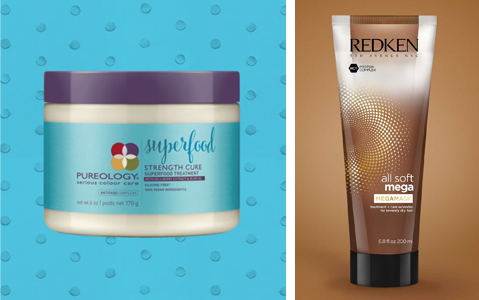 We recommend these hair masks: Pureology Hydrate Superfood Treatment or Redken All Soft Mega Mask. Another fact: the quality of light is different in autumn. (It’s science! The rays of light are longer, due to the tilt of the earth at this time of year.) And that light, unlike the straight-overhead, dazzling summer version, really is best for darker, warmer colors. So, if you’re blonde, go for butterscotch. If you’re rocking a light brown, go for caramel or toffee. If you’re a darker brunette, go for milk chocolate, or rich coffee. You can’t go wrong by choosing one shade darker and aiming for something that sounds yummy. This isn’t science, but it is something we’ve all experienced: the delicious feeling of turning the page and starting fresh. Regardless of what else is going on, in our lives or in the world, a mental reset can go such a very long way toward improving your outlook, energizing you, and boosting your self-confidence. And if it involves making your hair healthier, prettier, and super yummy-sounding, all the better! So, are you ready to light up the fall? What delicious color will you choose at your next appointment? If you’re not sure, we’re ready to provide that Salon Lucid pro guidance you’re used to (and of course, your delicious beverage of choice!). Just ask – we’re here for you!